I lament that my American church background offers me little support in this battle to defend the true nature of the church. In the U.S., we too have long been preoccupied with our church buildings. As evidence, I need only look at a congregation’s budget. How much is spent on the building where we meet – the electric bill, the maintenance and the cleaning, perhaps even the mortgage? Jesus was clear, “For where your treasure is, there will your heart be also” (Luke 12:34 esv). Our expenses reveal what we believe is important. Let me be clear. I am not opposed to the church meeting in a building designated for worship. But I firmly hold that the building should never take precedence over the true mission of the church. It seems to me that in many places, our buildings have replaced the mission. The problem extends beyond our church budgets. We have inadvertently fostered the belief that local evangelism entails inviting others into our sacred space. We expend our financial and human resources to entice people through the doors of the building. We encourage one another to “bring a friend to church.” We organize family friendly events at the building. We station a greeter at the door to make certain that visitors are warmly welcomed as they cross the threshold. These are all good activities, and we should continue doing them. But they all focus on bringing people in. Jesus sent His disciples out to seek and save the lost (Matthew 10:5-7; 28:19-20; John 17:14-19; Acts 1:8). We need to get out of our buildings and into our communities. Our primary purpose is not to invite friends and neighbors to join us in an auditorium; we invite them to an encounter with our Lord. This encounter may take place wherever we gather in His name. What, then, should we do? Should we abandon our buildings altogether? We must reclaim our mission. When we invite others in and cease to go out, we have forgotten our calling. When those around us recognize our dependence on worldly structures, then we know we are sending the wrong message. When an Angolan tells me that I need a building to worship my God, I know that my actions speak louder than my words. Three values of the New Testament church need to be reclaimed from our culture-induced focus on buildings. We seek the lost by searching outside the community of faith for those who need to hear the gospel. We should not wait for “seekers” to come to us; we become the seekers. Although we are not of the world, Jesus sent us into the world (John 17:14-19). Our presence in our communities ought to be our people, not our building. Christians should join local community organizations, such as the neighborhood watch; service-oriented groups, such as Kiwanis or the Lions Club; or special interest groups, such as bicycle clubs, book clubs or Toastmasters. Christian parents should coach sports teams or join the Parent-Teacher Association. Christian business owners should join the Chamber of Commerce or a trade association. Let us organize activities in which the church goes out together to serve at a local food pantry or an after-school program. We create opportunities to share the gospel when those around us notice the Christian character and hope that sets us apart (1 Peter 3:13-15). We must take up Jesus’ purpose: “to seek and to save the lost” (Luke 19:10). The New Testament encourages giving for two purposes: to meet the daily needs of one another (Acts 2:45; 2 Corinthians 8–9) and to support individuals who dedicate themselves to the proclamation of the gospel (Philippians 4:14-16; 3 John 7-8; 1 Corinthians 9:3-14; 2 Corinthians 11:7-9). The modern church ought to adopt the simplicity of the early church so that we invest less in the institution and more in the mission. The congregation as a whole should model generosity and sacrifice. Decisions to upgrade the sound system, pave the parking lot, buy new sofas for the teen room, enlarge the auditorium, or build a new building should not be made lightly. We must ask whether these expenses primarily serve our mission or the comfort of our members. Our giving to others reflects our generosity. Our giving to the building fund is something more akin to paying membership fees to a country club. Our contributions to furnish ourselves with a more comfortable environment in which to worship cannot rightly be called charity. Our church budget ought to reflect our true mission. We should minimize our spending on self so that we direct more resources to serving others and reaching the lost. I thank God for congregations that set aside a substantial percentage of their budget to support domestic and foreign mission works. We should also reserve a portion of our contributions for members who have urgent needs. This is the charity for which the early church was known (Acts 2:44-47; 4:34-35). Evangelism flows naturally from our engagement of the world and our generosity. Put another way, if our engagement and generosity do not create opportunities to share our good news, then something vital is missing. Not all Christians are evangelists (Ephesians 4:11-12), but all Christians should be prepared to share their faith (1 Peter 3:13-15). The responsibility of evangelism belongs both to the body as a whole and to its individual members. Our building-centered mentality is tandem to the belief that evangelism is only the work of the preacher. Christians draw friends and neighbors to a building so that the preacher may do his work. This model suits our culture. Our culture treats the minister as the specialist who alone possesses the skills and training for such work. We take our car to the mechanic, our dog to the vet, and our lost friend to the preacher. But the church building is not a spiritual garage or a religious emergency room. The building is merely where the body of Christ meets to equip themselves to make house calls. Our assemblies should prepare us to share our faith; they do not relieve us of this responsibility. Every member of the body shares the commission to make disciples. A healthy body works together to help one another in this common goal. Church leaders should focus on equipping their congregations to share their faith. God gave the church apostles, prophets, evangelists, shepherds and teachers “to equip the saints for the work of ministry” (Ephesians 4:11-12). The men we appoint as elders should be capable teachers (1 Timothy 3:2; Titus 1:9) because sound teaching is essential to prepare the saints to share the good news. Those of us with formal training (Bible and ministry degrees) ought to train others to seek the lost and present the gospel in relevant ways. Elders and ministers function as equippers, coaches or mentors while every member seeks opportunities to share Christ through his or her daily encounters. You might host a barbecue where Christians and non-Christians can mix and visit. Or consider volunteering with a local campus ministry, teaching Bible correspondence courses through World Bible School, becoming certified to teach English as a second language, or joining a prison ministry. We can all find a way to fulfill our mission. In Angola, we have succumbed to the cultural pressure to designate a “church building.” Our message is urgent, and this world is fleeting. We recognize that renting or building a church building is the quickest way for a new congregation to gain momentum. But in each of the young congregations we serve, we teach the true nature of the church from the congregation’s inception. We teach that “church” is merely another name for those who follow Christ. 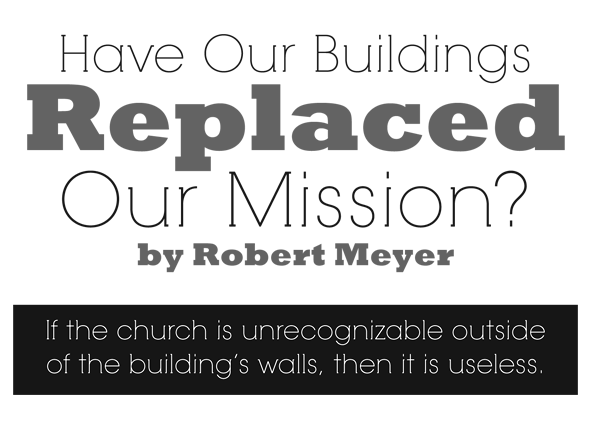 If the church is unrecognizable outside of the building’s walls, then it is useless (Matthew 5:13-16). The church proves itself through the fruit it bears (John 15:8). With this teaching in mind, Christ sent His disciples – the church – into the world to make more disciples (Matthew 28:18-20; John 17). I pray that this teaching grows deep roots in the Angolan church so that we will not be known by our buildings but by the way we share the truth in love. Robert Meyer is a missionary in Angola and may be reached at robert@angolateam.org.